PICTURE FRAMES TO DISPLAY FOR YOUR GAME MINIATURES AS ART. The MusterBox Kickstarter was a Success! I am finishing the casting of the rewards next week, and can then work on store sales. Thanks so much to everyone who supported MusterBox. Announcing the first MusterBox Kickstarter! Launching (probably) July 17 2018, featuring Double Dungeon and Manticore Manor. The first wave of Rewards will ship in September, with subsequent waves scheduled further out. You spend hours painting your game miniatures and you are justifiably proud of them. But then they go back in storage and you only take them out to play once in a while. Muster Boxes gives you a picture frame style display case to show off your hard work and mad painting skills. The thin display format hangs on the wall, integrates into your home or office decor and requires zero table or shelf space. Magnetic tape keeps your miniatures in place and the removable outer frame means your creations are ready for action. Clay modeled 6 x 9 prototype for the fist Muster Box. Double Dungeon provides an upstairs/downstairs layout with finished chambers above rustic and natural spaces. The variety of spaces and levels accommodate any standard-ish 28MM miniature and provide various layout options. 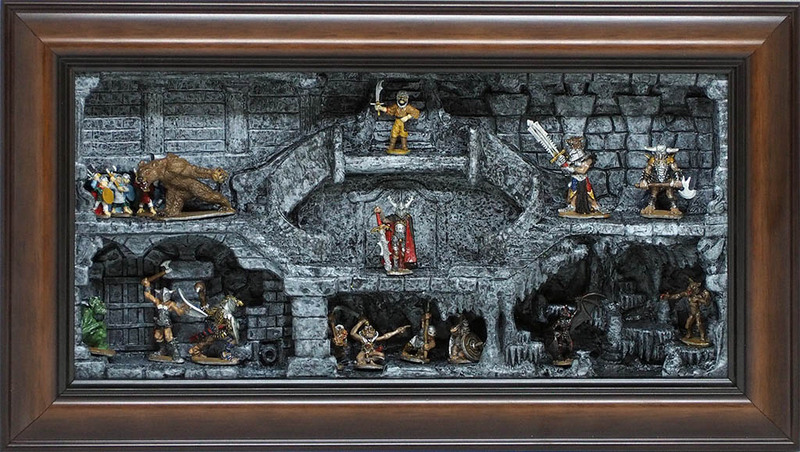 Show off your best painting triumphs or setup a dungeon crawl diorama. Manticore Manor is a multi tiered interior space with some eastern hints. The base presents an exterior facade and imposing entry way with a rusticated and formidable presence. Above that the levels become lighter and more playful. There are many options for standard 28MM miniatures and vignettes of tiny strife.